More Choice, Faster Delivery, Quality DIY Sliding Wardrobe Doors Made To Measure....Delivered To Your Bedroom. Sliding Wardrobe Doors direct from the manufacturer great prices and value for money, without cutting corners on quality and service, for any help, prices or advise please don't hesitate to call me, Neil on 01293 776030 or 07724 668802 or get an online quote by clicking the red box above. I don't ask you to pay upfront, just £100 deposit with your order and the balance on delivery, I think this is a fairer way to do business and I hope it shows how confident I am with my sliding wardrobe doors. ...........the doors were delivered promptly in less than a week. They are an excellent product, my builders who installed them said that in all their time they had never seen such solid quality before. Needless to say I will recommend them to anyone. I had previously had installed smaller doors in an other bedroom, these were double the price and not a patch on these. A quality product, and a quality service. 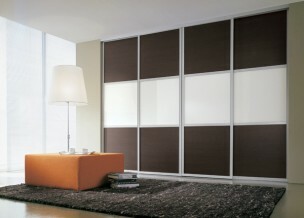 Made to measure mirror or panel sliding doors that consist of different colour panels within the same doors.